Antarctica and the European Arctic are a photographer's dream. Whether it be sitting quietly in the middle of a penguin rookery, visiting quaint historic sites or enjoying the thrill of a breaching whale or polar bear in pack ice, there are an overwhelming number of opportunities to snap until your heart's content. Each of Aurora's expeditions offer fantastic opportunities to get behind the lens of your camera and take those dream shots. However, some expeditions are tailored specifically for those looking to focus on their photography. On Aurora's special photographic departures, its on-board professionals deliver Canon-accredited photography workshops and one-on-one instruction from the deck or Zodiacs and during landings. At sea there is time for lectures, photo critiques and photo-imaging workshops. Catering to both amateurs and the more serious photographer, Aurora's style of travel means that you're up early, enjoying the best light of the day as the sun rises and sets. 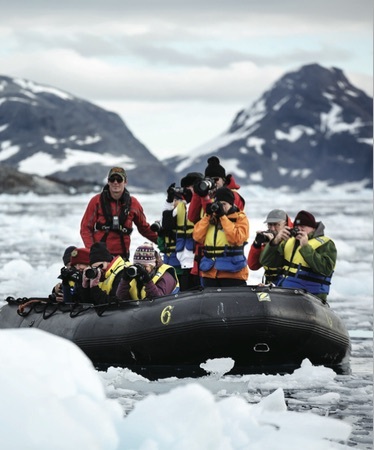 Expeditions are strictly limited to 54 passengers offering you an intimate, personal experience and more opportunities to get out amongst the nature and wildlife. Photography is complimentary on selected expeditions. If you would like to take part in Aurora's photography workshops please tick the 'photography' box in the activity section on your booking form. Your booking form and deposit is required to confirm your place. People who ordered Polar Photography Handbook also ordered the free travel brochures below. Click on the images to find out more about these brochures.